When I produce Tallahassee neighborhood home sales reports, I most often use information that has comes from the Tallahassee MLS. But often times, when I am researching neighborhoods that do not have many home sales, I then have to go to the Leon County Property Appraiser to get the rest of the sales that have not been recorded in the multiple listing service. This report is one of those "need more information" jobs, so the information contained in the real estate graphs and table below comes from both the Tallahassee MLS as well as Leon County. This is the most thorough analysis of the Bobbin neighborhoods (Bobbin Brook, Bobbin Trace, and Bobbin Mill Woods) that you will find on the internet. The first graph below shows the decline in the number of home sales that Tallahassee has been experiencing has not really affected the Bobbin neighborhoods as a group, though Bobbin Brook has seen the "typical Tallahassee" decline during the past few years. 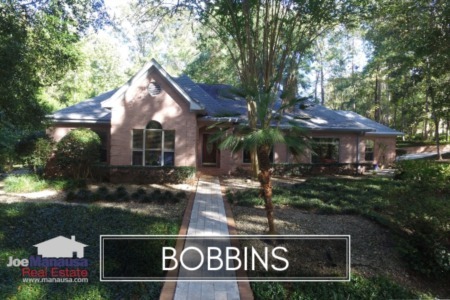 Currently, there are 8 homes for sale in the Bobbin Neighborhoods. 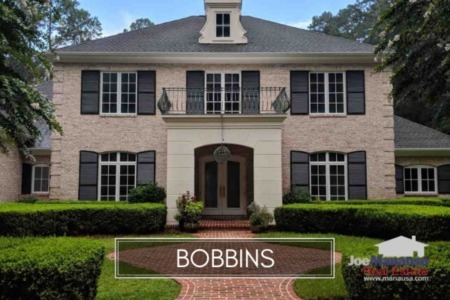 Though the total unit sales figures have not changed much, home prices in Bobbin Brook, Bobbin Trace and Bobbin Mill Woods as a group have fallen 45% since the peak of the market. The graph below shows the type of results you get when you try to create an a report with limited data, and the slight increase in price in 2011 could be due to the fact that only one home sale has been recorded thus far this year. Home values have not fallen as far as home prices, indicating that home buyers in the Bobbin Neighborhoods have been choosing the smaller homes. Luxury homes for sale that were built and sold during the boom of the market might find some difficulty selling in a market with very few homebuyers willing to pay more than $700,000 for a home in Tallahassee. Home sellers are advised to plan to wait 5 to 7 years for the market to balance. If you cannot wait that long, then sell your home as fast as possible to get top dollar.